This mod adjusts water physics when digging sand near water in an attempt to prevent ugly appearances of flowing water. This means you can go dig up that sand you really needed without having to worry about ruining the environment. Left: without the mod. Right: with the mod. Note that this mod will create water for free, so it's not really suited for cases where water is meant to be limited. 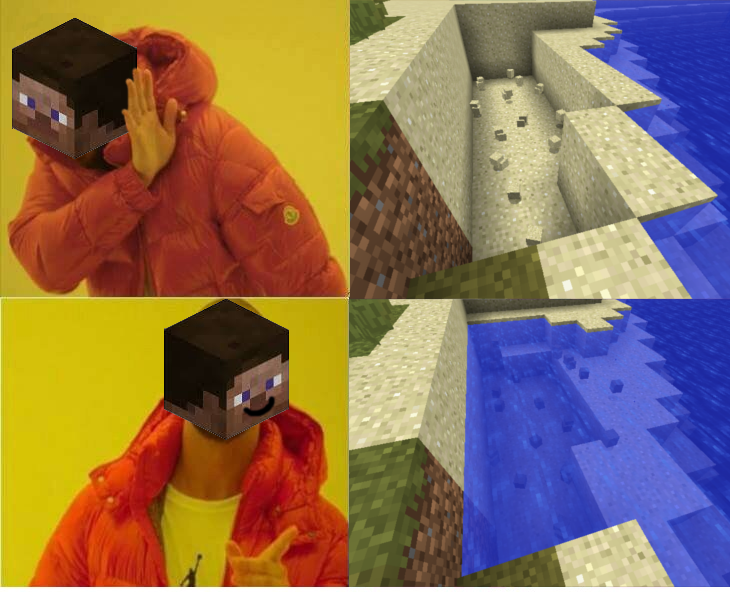 It's super simple - when sand is broken next to water, instead of it becoming flowing water like it would in Vanilla, it becomes a source block even when the usual infinite water conditions aren't fulfilled. This allows you to dig up sand near water without worrying about being pushed around by water or leaving an ugly environment behind. Additionally, it can also fill up more than one hole at once (though it does not go further than three blocks), in case you didn't start digging next to water at first. It might be too simple and trigger in cases where it shouldn't - if you come across these, feel free to report them and I'll see if I can solidify the implementation to really only work on beaches, where it should. This is a nice mod, and very useful when used alongside the non-infinite water in Better With Mods. I appreciate you making it, thank you. May I ask that you implement this functionality with gravel beaches, as well? Or perhaps a way for users to specify which blocks trigger the alternate water physics? Ha, apparently I've forgotten how to use a config file. Silly me. Uh all it does is make infinite water sources from everything, and floods do massive damage. If that's happening to you, then that's a bug and I'll need more information to be able to fix it.